Next generation color reproduction: Nikon’s most powerful image processing to-date delivers color images that are both natural and accurate, delivering true-to-life color reproduction and realistic transitions. 1,005-pixel 3D Color Matrix Metering II: Nikon's exclusive light metering technology intelligently evaluates numerous elements beyond simple brightness and compares its findings against an onboard database of reference images. Complex and otherwise time-consuming, exposures are determined instantly, resulting in consistent and dependable digital imaging exposures. The advantages of 3D Color Matrix Metering II are provided in the high-speed crop function which also optimizes the areas calculated for using center-weighted metering and i-TTL flash control. Sharp, clear 2.5-inch TFT LCD display with a 170-degree wide-angle viewing: The D2X incorporates a large 2.5-inch 230,000-dot, high-resolution LCD monitor display with an ultra-wide 170-degree viewing angle for clearer viewing. It also offers larger type fonts that improve access to color-coded menus. Broad color mode options: Adobe RGB profile (color mode I and II), as well as the option of the sRGB profile enables photographers to set the best color mode based on their shooting needs. Additionally, a new black and white capture mode is now available. 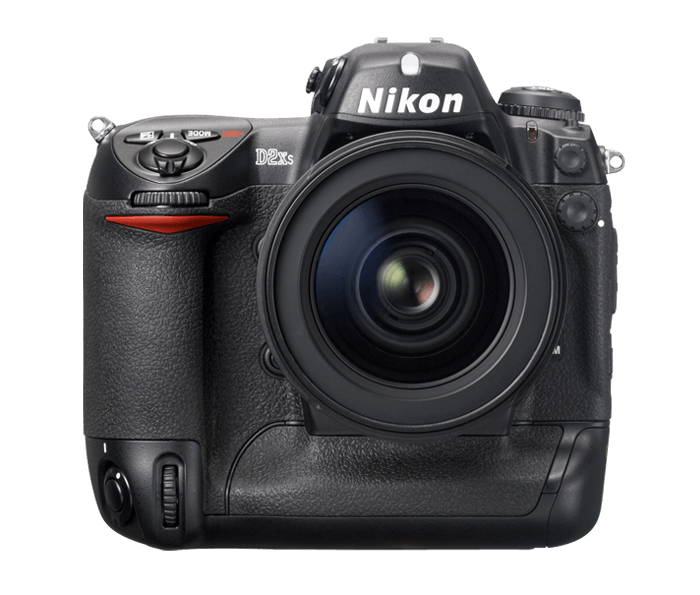 Support for Capture NX: Capture NX offers the exciting potential for Nikon Electronic Format (NEF) files, JPEG and TIFF images. Refined through revolutionary U-Point technology, it greatly simplifies the selection of objects, colors and areas supporting highly accurate alterations to a myriad of image elements while also preserving the integrity of the original image data.